Ministry of Propaganda - 08/Dec/2004: "Back in Swindon"
Back in dull and grey Swindon. OK, Glasgow wasn't exactly sunny on my last day in Scotland either. 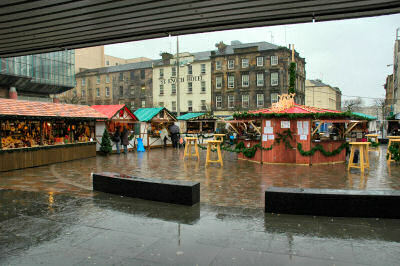 Actually, it rained most of the morning, I was glad that I could shelter in the various book stores and at the stalls of the German Christmas Market on St Enoch Square. As I still had the long drive to Swindon ahead of me I could only drink one Glühwein, very nice. The book shops also made way too much money from me again. I bought four of the pocket mountains guides: Central Highlands, Southern Highlands, West Highlands and The Islands (Skye, the Hebrides and Arran). They look very good and should provide me with plenty ideas for future walks, I wish I had discovered some of them earlier. I also bought Francis Wheen's Hoo-hahs and Passing Frenzies after finishing the excellent How Mumbo-jumbo Conquered the World: A Short History of Modern Delusions recently.